Say you have a Mazda Miata. It doesn’t matter what generation Miata you own – there are many options to make your Miata into a track monster, a daily driver with some oomph, a canyon carver that will hang around with a Porsche 911 GT3, and anything in between. If you don’t have a Miata, I highly encourage you to get one. Hop onto Craigslist, type in “Mazda Miata” and see what comes up. You can get one for $1,000, but I wouldn’t recommend that, unless you know what you are going to do (i.e. yank out the engine, put on new bodywork, etc.). If you know what you want to do, get one for cheap. Otherwise, my rule of thumb is get the nicest one you can get. Paying a few thousand dollars more for one that’s been taken care of, has a paper trail, and no accidents will mean less of a headache for you down the road. The Miata was designed with extreme abuse in mind, so keep in mind it’s pretty hard to break them. They are durable cars, and will hold up to more abuse than many new cars. Monster Miata: Ever wanted to stuff a V8 into a tiny roadster just for the hell of it? That’s exactly what Monster Miata did. The overall structure of the Miata is more than capable of holding up to the massive stress of a V8. It’s almost as if the Miata was built for it! Monster Miata certainly has the expertise – they have done over 100 conversions in the past 20 years. You can have Monster Miata do the conversion for you, or you can do it yourself through their incredibly detailed instruction manual. You can buy the kit (not including a motor) for $3,995, which includes everything you’ll need to shove a Ford 302 V8 into one. You can find a Ford 302 V8 from a 1980s-1990s Mustang for $1,000. Throw in the fact you can get well over 400 horsepower without having to put a supercharger or turbocharger onto the engine, figure about $1,000 for everything. What do I mean by everything? The car, the kit and the engine. That’s a really good deal, especially because the Monster Miata cars are designed to be daily drivers, but track cars, autocross cars, and weekend warriors all in one package. Check them out at monstermiata.webs.com Doesn’t look like it’s going to fit, does it? Flyin’ Miata: Flyin’ Miata started modding Miatas when they came out in 1989. They have everything from V8 conversion kits to turbocharger kits. Flyin’ Miata stuffs GM’s wonderful LS-series engines into the tiny engine bay of the Miata. The car gains less than 200 pounds, 1/3 of which is on the rear wheels. Road & Track tested one in 2013, and it hit 60 mph in 3.8 seconds. That’s Porsche 911 territory. Automobile Magazine compared it to the Shelby Cobra. A Flyin’ Miata will be a bit more expensive, but it’s well worth it. 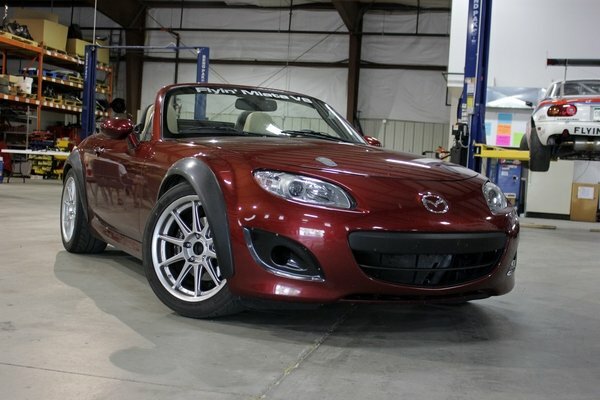 Monster Miata only does NA generation Miatas (first generation) conversion kits. Flyin’ Miata does V8 conversion kits for all generations of Miata. I’d go for an NC generation Miata (third generation), just because I like them the most. Oh, you can also buy used ones from Flyin’ Miata. Don’t worry about repairing them – any engine, transmission, or rear end part can be bought at any GM dealer, and most other parts can be bought at your local Mazda dealer. Want to keep the little four banger but want near LS engine power? Not a problem! You can get a turbocharger from Flyin’ Miata, as well as all the necessary parts. It’s literally a bolt-on process. This Miata is Flyin’ Miata’s test bed. They call it “Atomic Betty.” Several magazines have likened it to the Shelby Cobra 427. Now, some of us might not have that kind of money. Don’t worry if you don’t – there are still plenty of options to make your Miata a speed demon! Tires, tires, tires: I can’t say enough about how a good, sticky set of tires will dramatically improve the handling characteristics of your Miata. Get a set of really sticky summer tires, and if you daily drive your Miata, get a set of all-season tires that will last a while. This will mean a couple of sets of wheels, which I’ll talk about in a second. Just keep this in mind: the right summer/track tires can make the difference between winning and losing a race, but they come at an expensive price. Tires aren’t exactly the cheapest things on the planet, and considering that the Miata is a small car, you probably won’t have room to put four wheels (with tires on them), plus a cooler, tools, and whatever else you bring to the local autocross or track day. Think about towing the car if you can, or get a really small trailer. Lots of grassroots racers do that. Also, ask your friend if they will loan you their truck for a day, or ask a racing buddy who has a truck and is going to the same event if they can grab your tires. These might be all-season tires, but they are sticky all-season tires, along with wheels designed for the Miata. Wheels can also make a big difference. A carbon fiber set of wheels will shave a good 20-30 pounds off the weight of your car. It might not sound like a lot, but consider this: lighter wheels + stickier tires = more smiles per mile. There are a lot of options for wheels, and tires. Like these wheels? How surprised would you be if I told you they were the stock wheels plasti-dipped, and with the center cap removed? That’s probably a modification under $100 for all four wheels. Cold air intake: Want a bit more power out of your Miata, but not so much? A cold-air intake is a great investment. It works as a kind of ram-air system. They draw cold air from outside the car into the engine. Because of this, combustion requires less heat and fuel, which means a more efficient burn. Acceleration will increase, not dramatically, but you certainly will notice it. Your fuel economy will also increase, no matter how hard you drive the car. The engine note will be louder and more aggressive. It won’t bring the cops to your house at 1:30 a.m. when you’re revving it (good ones won’t), but it will have more of a roar then before. 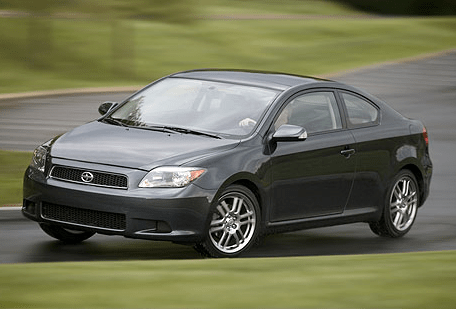 Get one from a reputable brand like: K&N (who promise, and deliver an extra 15 horsepower or your money back), Injen, Volant and Airaid. This is a great modification, and it’s pretty cheap too! One from, say, K&N, will cost about $300-400. Here’s an example of a cold-air intake on a Miata. Saves a lot of space in the engine bay and boosts performance! Bigger brakes: If you’re planning on seriously autocrossing or tracking your Miata, invest in bigger, better brakes. You don’t need to go all-out and get massive 14-inch disc brakes – when you hit the brakes, the car will literally catapult you out of it! Step up about an inch or two in rotors, and don’t go above four-piston calipers. I’d go for EBC brakes. They provide great stopping power at an affordable price. EBC Brakes is a British brake company. Think of them as the working man’s Brembos. 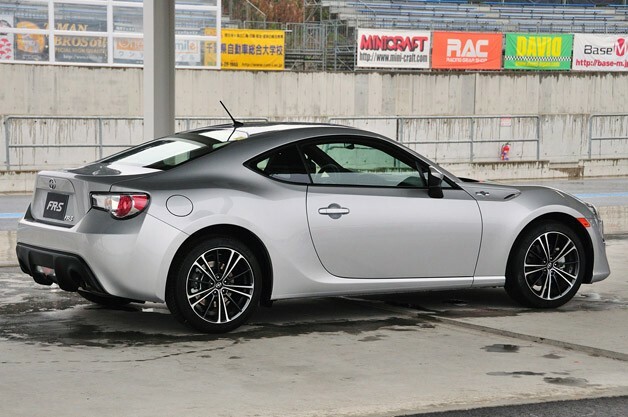 Upgrade the suspension: Get adjustable coilover shocks, better struts, etc. They will make the ride a bit stiffer, but if you’re serious about driving the car hard, the added stiffness will pay off. Here’s an example of a suspension upgrade kit. This one is from Flyin’ Miata, and has just about all you need to keep your car a daily driver and be truly flyin’ at the track. Racing seats: Most tracks will not allow you to track the car without a racing seat, a HANS device (I’ll explain that in another post), a five-point harness, a track suit, gloves and a helmet. Those are all great investments, and I’ll get to them in another post. They are a bit too much to explain how to get in this post. But, a racing seat is a great investment. Look at Corbeau, Recaro, and Sparco. They are all incredibly comfortable, and you can keep the stock seatbelts in the car, so you don’t have to buckle up into a five-point harness every time you have to go to get milk. 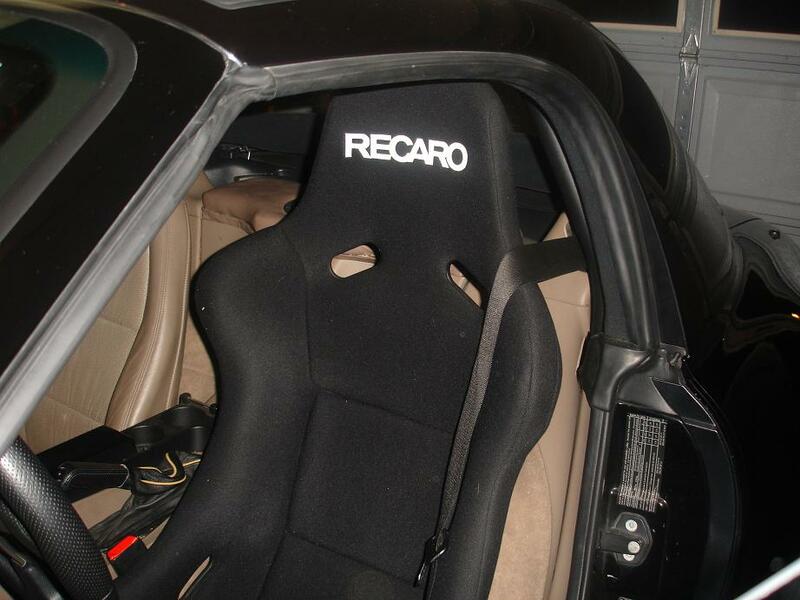 Here’s a good example of a Recaro in a Miata, but just be careful of hitting the convertible top with the seat. Some seats are quite tall, and then it’s a bunch of hacking the floorpan to make it fit. The stock seat is the passenger seat, which the builder left in the car for comparison. Rollcage: If you are going to track the car, definitely get one of these. A rollcage will protect you when you flip over at the track. Airbags will only do so much to save you. Not to say they aren’t great, because they are, but they won’t help very much when you flip going 110 mph. That’s where a rollcage will. The car will be damaged, but you should be able to walk away with only minor injuries. Go to a trusted and highly recommended fabricator. It should be a piece of cake for them. You should also get it padded, because a rollcage will seriously injure you if you’re driving without a helmet on. Most of the time, the padding can be removed if the track safety officials won’t allow it. This is a padded rollcage for a Miata, but it still allows the convertible top to go up and down. Less weight: Never really used the air conditioning in your car? Rip it out and there goes about 30 pounds. Keep the heater core and all of the defroster stuff. Rip out the soft top and get a hard top. There goes another 30 pounds. Remove the spare tire and jack from the trunk, and that’s probably a good 30 pounds. This will free up trunk space, and you can get a tire repair kit. That right there is 80-90 pounds. 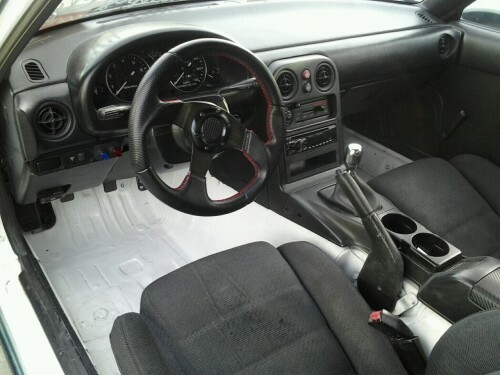 Ever wondered what a stripped-down Miata interior looks like? This. It’s still perfectly functional, but all the heavy carpeting is gone. All of these options are great. You will love the added performance bonuses all of these options give you. 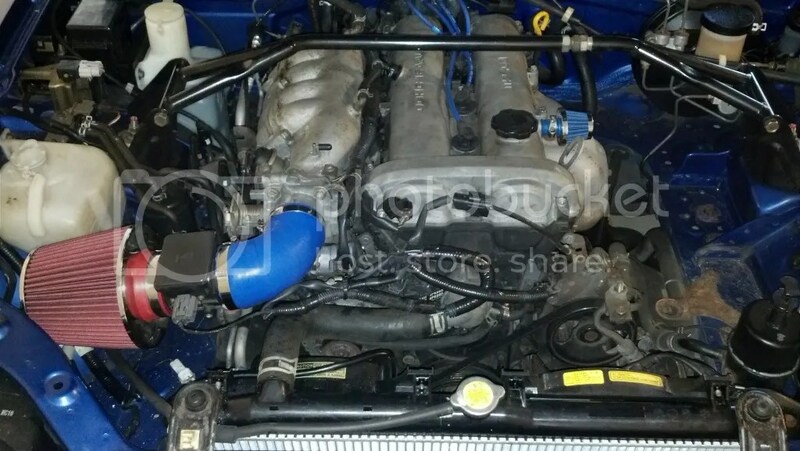 Think about it this way: if you don’t want a massive V8 in your Miata, all of the cheaper options I listed will total about $10,000, which is about the same price as one of the V8 conversion kits (before the engine). Excuse me, I have to go onto Craigslist and find a Miata to do all of this to. As always, donations are gladly accepted. I have always wanted one, after all…Why not go all out and get one with a V8?